Board Index > General Chat > Anything Goes > News about the Macon book signing? Author: Subject: News about the Macon book signing? I was wondering if anyone in here attended the book signing at the big house and how it went. This is the latest from The Telegraph, with a good pic of Gregory. Two hundred people lined up in front of The Big House Museum Sunday, with some waiting more than two hours. just for the opportunity to spend a few moments with rock legend Gregg Allman. 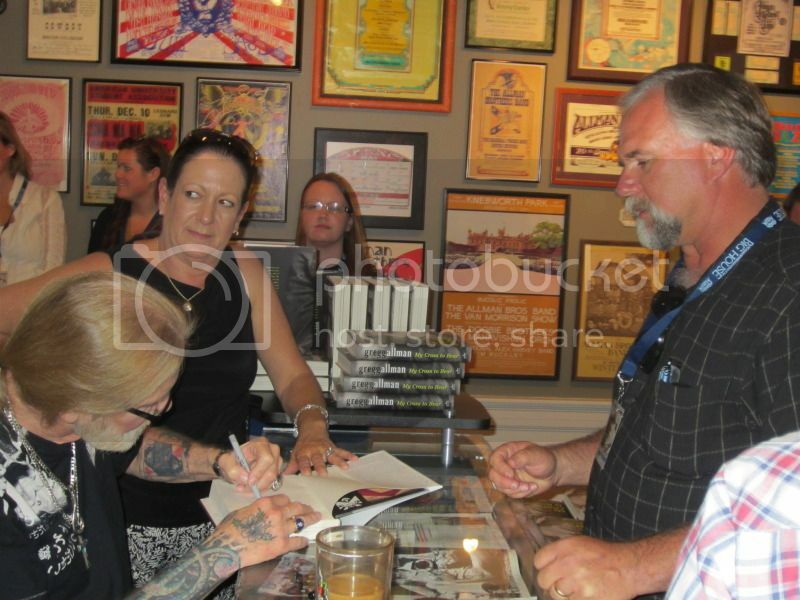 Allman was in town to sign copies of his autobiography, “My Cross To Bear,” which is ranked No. 15 this week on The New York Times Bestseller List for non-fiction books. The event was held not only to promote Allman’s new book, which details his life and career as a co-founder of The Allman Brothers Band, but also served as a fundraiser for the band’s museum. Lisa McLendon, executive director of The Big House, said it was the first time the museum sold tickets for a book signing, which went for $125 apiece and were limited to 200 people. She said people came from across the country for dinner, an autographed book and a chance to meet Allman. The Big House, which was the home of band members as well as serving as the band’s unofficial headquarters in the early 1970s, was turned into a museum which opened in late 2009. McLendon said the event is expected to raise $20,000 for the nonprofit museum, which averages about 1,000 visitors per month. One of the most excited out-of-town visitors at the event was Shannon Williams, to whom Allman recently became engaged. She said the visit marked the first time she’s been to Macon and seen the museum. Williams said she especially enjoyed seeing pictures of Allman and the band over the years as well as the vintage clothing the band wore that hangs in the museum’s displays. Allman’s visit also was a thrill for his fans and the museum’s volunteers. Janice Vinson of Gordon said she’s been a fan of the band since the 1970s. She serves as a volunteer, welcoming visitors to the museum and in the gift shop. She’s already finished the book and said it had a major impact on her. Vinson said her work with the museum was one of the positive things in her life as she successfully battled breast cancer. Craig Stevens visited Macon from Fairfax, Va. and has been to The Big House before. “I love The Big House, and it’s a chance to meet the man,” he said. Stevens said he’s already read the book. Louie Folino and his brother, Mark, traveled from Cincinnati to Macon with four other family members. Mark Folino had the opportunity to spend a few moments with Gregg Allman in the bedroom of his late brother Duane. “We were in Duane’s room, and we turned around, and (Gregg) was just there,” he said. Neither of the Folinos have had a chance to read the book yet, but planned to do so on the plane ride back. $ 125 is a mighty steep price for a book and a bbq plate. Wow, Gregg looks a heck of a lot better in the photo above. Clearly the week of rest at home has done wonders for him, so glad to see it. Anxious to hear Wayne, Dave, and John's report on the events and see any photos they got. OK, the book signing went well.....REALLY well. Keep this in mind. The $125 price tag wasn't just for the book, BBQ and Big House gift bag. This was a fund raiser for The Big House, a place dedicated to the preservation of ABB history. A lot of time, effort and money went into creating the Big House Museum, and it would be a terrible waste if it were to ever have to close down for lack of funding. I am all too happy to do what I can to help keep it going. John, Wayne and I arrived in Macon right around 4PM, about the time they closed it to the public. 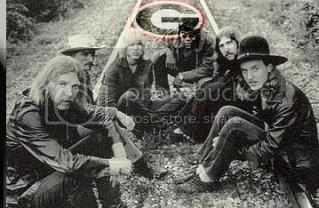 It's my understanding that Gregg and company arrived in Macon much earlier, visiting the Big House and mingling with visitors before leaving again to return later for the book signing. They arrived around 5PM or so, entered through the gate, got out of the car they were traveling in, waving to the crowd as he emerged. Gregg's entourage included Chank, Shannon and I can't remember the lady's name who was assisting him with the book signing. Gregg spent some time up in "the casbah" and conducted at least one interview before descending the stairs to come down and begin greeting and signing for the fans. John, Wayne and I were fortunate enough to be recruited as event volunteers after we arrived, even though we had already bought our tickets. The Big House staff and volunteers got to be greeted and treated first. Gregg was in very good spirits and appeared to be in much better shape than he has appeared at previous book signings, which was a relief. He appears to be on the mend, as prayers for him must have been heard and answered. Got to speak and hang with Chank a little bit, which is always a pleasure, didn't get to meet Shannon, but she quietly stood back and took it all in. She appeared to me to be a quiet and unassuming pretty young lady. Gregg greeted fans, signed books, shook hands and handled this event very gracefully. He stayed until the line ended, passed the 8PM event conclusion. He then retreated back to the casbah with Shannon, and his assistant rounded up some BBQ and sides for them, that I just happened to be lucky enough to help with by carrying their drinks up, where I quickly sat them down and said, "Y'all enjoy," and went back downstairs with the rest of the crowd. When Gregg signed my book, I was unsure of what to say, so I asked him, "How you doing Gregory?" He answered, "I feel pretty good, man, thanks." I then told him it was good to see him out and about, that we'd been pretty concerned about him. I then asked him, "You've heard of GABBA, I suppose." He said, "Yeah, I have." I said, I'm Dave Pierson, GABBA president." He looked up at me and said, "The guy in front of you just said he was GABBA president." I looked over at John (Bluedad) and said, "He's vice president. I'm president." He just looked back down and finished signing and handed me my book, said "Here you go," and I said, "Thanks man, God bless," to which he said, "Thanks, man." He did sign my book to "Big Dave," thanks to his assistant. I wish I could recall her name. She was very nice. Later, I asked Chank to sign it, too, and he was hesitant at first, but said, "Man, I don't normally like to do that, but since I know y'all....man, I ain't nobody." To which I replied, "I ain't nobody either, but you signing my book makes me feel like I'm SOMEBODY!" We both had a good laugh over that. Chank is a fine, fine human being. As expected, I saw many friends from the ABB community, Hophead, PoetJohnG, The Potters, Kevin and Carol McDonald, and many, many others, and I got to make a few new friends, too. We didn't leave Macon until close to 10PM. I had a jam up time yesterday. Thanks again to my Road Dawg, Bluedad, and to Wayne for the good time we had together. I think Dave sums it all up pretty good, not sure the day could have gone any better! Hanging with with Dave and John, getting to meet Gregg, shake his hand and speak with him for a quick moment, take some pictures, having him personalize the book to me, seeing some friends and making some new ones. And getting to help work the event was cool, got to talk to a lot of people that way. There were a lot of happy people at the end of the day. Thanks again to John and Dave for the company and John and E.J. at the Big House for the invitation to help out. It really was a great day! I think Dave sums it all up pretty good, not sure the day could have gone any better! Hanging with with Dave and John, getting to meet Gregg, shake his hand and speak with him for a quick moment, take some pictures, having him personalize the book to me, seeing some friends and making some new ones. Thanks to both you and Dave for the posts. Will you be posting any of the pictures? Glad to hear it was such a good event and that Gregg seems to be doing well. Thanks for sharing guys. Looking forward to August 1st in Atlanta, purchased my mini series tickets on Sunday. With this in mind I'm sure a Music Today pre sale with outstanding seats available will be announced anyday now. I have a few to edit and post. A bunch are popping up on Facebook. Will get to them soon. Thanks for the report Dave. He does look much better. More color in his cheeks. I can't believe Bluediddy tried to stage a coup because he was in front of you in the line. Well, actually, I can believe it. Cool post Dave. Thanks! I like the pics too. Glad to hear and see that Gregg is doing well. Alan, it wasn't an attempted coup. Bluedad actually said, "I'm with GABBA." Gregg must have misheard, or misunderstood. I just thought it was funny. I'm surprised Bluedad didn't say "I'm with Shannon"
As things were winding down from the event, I was asked to go upstairs into the "Roadie Room" part of the museum. I went up and waiting for a few minutes and was taken to a staff room across the hall. In the room was Duane's 57 Goldtop and a Crate amp. I was told to plug in and indulge myself. sat up there and played that guitar for 15 or twenty minutes, just me and the guitar. No pictures, no videos, just me trying to play some Duane licks..... Thanks EJ E.J. Devokaitis! WOW! Worth the price of admission right there! Keep your book - keep your barbecue! John, I'm sure you did Duane's LP justice! I probably would've just soiled myself had I been given the chance! I was wondering if anyone from HTN was there? Ann, your title has me laughing because I was just in my car and i was listening to 880AM in NY. All of a sudden I hear Statesboro Blues come on. I got nervous and thought maybe Gregg had another health issue. Then the story went something like, "The 64 year old Mr. Allman took the time to show off his new 24 year old fiance this past weekend in Macon at a charity event." The part about the charity function was an after thought in the report. Seems Gregg is still attracting the hollywood paparzzi type reports. When Dave and I went upstairs to see John, I think he may have had the biggest smile of his life on his face after he played Goldie! Pretty cool moment, I was very happy for him. I heard a Gregg Allmans tying the knot announcement a couple weeks ago on the same station when the news broke (a day or two after Piers) but they used Rambilin' Man for the music. Glad to see they corrected that. What tunes did ya play John? Don't know what tunes John played, but I'd have been mighty tempted to write a song titled, "Jumpin' Out the Window with This Here Gold Les Paul". Way too cool. Good for you - and a tip of the hat to EJ.